How many of us put ourselves in our customers’ shoes and see and feel how they experience us and our business? Let me give you a “real-life” example of utilising Reality Immersion to Increase Sales and Profits. Michael Vance, professional speaker, tells a story about a dentist whose business was not doing very well, so he decided to go to a seminar on how to market more effectively. When he came back from that seminar he and his secretary went through the office on their hands and knees, taking a child’s view of their office. They got a feeling of what it was like to be a child at the dentist’s office. The first thing they noticed was that the guest desk was too high and the children who came in had to look up over the desk. They had the desk inset into the floor and put little chairs in the front of it so that the children could sit down and have eye contact with the receptionist. They even took the medical forms and made them simple so small children could help fill them out. Colourful graphics that educated children on caring for their teeth were placed on the wall and headphones were installed in the waiting rooms so that children could listen to stories and dental care tips on CD’s. They built a play area for the children in the waiting room. Then they did some research. After the children had their teeth examined, the receptionist would help them fill out a form on how they felt about their trip to the dentist. The most common complaint from the children was that they were terrified before the dentist did the work because they did not know what he was going to do. The dental staff did some brainstorming and decided to explain the process to the children before the staff actually did anything. The child would work on his or her own teeth without the instruments being turned on. This showed the child exactly what was going to happen, and it reduced the anxiety. To top it off, on their way out the children received a signed photograph of their dentist to put on their wall – their hero! Later on after the company grew, pictures of the dental assistants were put in the lobby so the children could choose the person they wanted to help them. The business in that dental office doubled. When I was one of the two consultants on the Nedbank sponsored “Fix my Biz” 13 week Reality T.V. Program on etv (now It’s my Biz), we used a similar approach with a new dentist in the West Rand in Gauteng. He saw a noticeably difference in customer satisfaction feedback and little feet through the door. 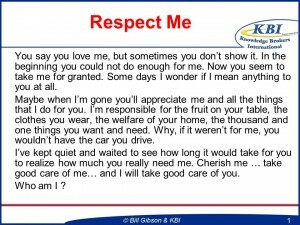 If you are selling to individuals there may be ways to help and be of better, impactful service to their family members. Brainstorm what needs to be done from the customer’s point of view. In dealing with an organisation, look at ways to make a personal assistant or key decision maker’s secretary’s job easier when dealing with your company or with her boss. See it from her perspective. It could also be providing the accounts department with extra information to make their job easier when dealing with your company, or giving them extra breakdowns that helps them do their jobs faster and more efficiently. Think, see and feel from the customer’s point of view. 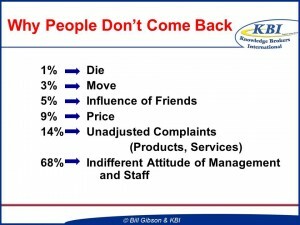 14% of the time you or I do not return to the average place of business is because of unadjusted complaints. It is important to teach your employees how to handle complaints because complaints can even gain additional business as well as save business. I’ve had the occasion to complain about the meal in a restaurant expecting the server to do very little about it, and to my surprise find out there was no charge for the meal, an apology by the Manager and a gift certificate for another time. In this specific case I made it a point to utilise the gift certificate and bring two other couples with me. I’ve also told dozens of friends about the restaurant. Preparation! Preparation! Preparation! Preparation! Preparation! If I were to let you know what a client’s problem, concern, question, objection or complaint was going to be two days in advance of meeting her, you could easily handle the situation. The reason why, would be cause you had time to prepare and come up with some answers. In my opinion complaint handling is about being prepared. It is much like handling objections. We suggest you use this 6 Point Process to Handling Complaints and Objections. Implement the following 6 Point Process for Handling Complaints and Objections and you will handle most objections, problems, complaints, questions, scenarios and situations with ease. Brainstorm with your colleagues all the possible problems, concerns, complaints, objections, questions, situations, scenarios, challenges and hurdles that you’ve had in the past, are having now or could have in the future. Take this list and prioritise them from the most common to the least common. Then brainstorm 4 to 5 Solutions and Answers for each one of these complaints, objections, questions, situations, concerns and problems etc. Build a list of the complaints/objections and then put the solutions, answers, or responses for each complaint/objection under each complaint/objection. Post them where you can see them. Carry them in your Planner, on your Tablet/Smartphone or on your Laptop or put them in a Complaint/Objection Handling Guide. Review them regularly. If you are a sales or service manager or business owner continually test your team and give small rewards for the right answers. You could have “complaint of the day” or “objection of the day” at your meetings. You must keep the answers at the top of your mind and on the tip of your tongue…that takes practise. Following are two examples taken from our Objection Handling Guide with 103 Common Objections & Responses that account executives and salespeople may receive from a client. The examples are Objection #16: “We’ve Had Bad Service In The Past With One Of Your Divisions” (Electronic Security) and Objection #17: “We Had A Bad Experience In The Past With Your Division” (Electronic Security). These were originally part of an Objection / Complaint Handling Guide I built for an Electronic Security client. 16.1 I feel like I’ve come in halfway through a sports game and don’t know what happened in the first half. Can you fill me in on what happened? 16.2 Even though I have no control over another Division of Electronic Security Inc. … I must apologise, because I’m part of Electronic Security Inc. even though we run separately as units. I’d be interested to know what happened. Would you be kind enough to tell me? 16.3 As you probably know we work literally as separate businesses but I must apologise for whatever was done that upset you or inconvenienced you. If you were to work with us what would be your expectations of being treated properly. 16.4 Besides the experience with Division A of Electronic Security Inc. what else is it that might prevent you from considering our services? 16.5 Even though you had a bad experience with Division A, what is it that we’d need to do to gain your confidence? 16.6 Please share with me what happened! Client: Here is what happened …. Etc. etc. Marketer: Here is what we do to prevent these kinds of things happening in our Division. 16.7 I’d really not want to see you lose out on a service that is helping many clients create a better bottom line because of an experience with another Division of Electronic Security Inc. Can I take a few minutes to show what we do and how you can be assured of excellent service and real tangible savings and increases in security while still giving you a better bottom line. Marketer: Based on what you’ve told me … I’d say you’ve been kind to me. I think if I had that experience as a client I would’ve been more upset than you. Look, I’m sincere about doing a good job and having you as a happy client. What can I do to help re-establish a relationship with you? 17.3 Things have changed with us. Here are several recent quotes from our clients. Marketer: This time I’d be the one in charge and here is how I work with clients to ensure they see the real benefits they pay for. 17.5 I can relate to and hear what you are saying and certainly understand your position in reference to us. At the same time I think you’d agree with me that some of the best relationships you have with some clients got off on the wrong foot. Then you were able to correct it and ended up with a happy client. I’d like that opportunity to show you what we can really do and correct the past with excellent service in the future. Will you be so kind as to at least allow me to present how things work now? 17.6 That’s why I want to review this checklist with you. It will clarify how we do business now. Note: Personally I believe every company should have an Objection Handling and/or Complaint Handling Guide made up of examples like the two examples above. Get written authority from your manager to do certain things when handling complaints/objections or at least guidelines you agree with. Give customers a few options. Ask customers how they’d like you to handle the complaint or situation. If their suggestion is reasonable, Do It! Let customers ventilate before using logic. They won’t listen until they calm down a bit. Validate how they feel. Show respect to the complaining customer by going to get a manager or the owner. It makes them feel more respected. Volunteer to do that before they suggest it. I trust this blog article will help make the handling of objections and complaints much easier. As a continuum from last week’s article I am giving you more vital tips to help you Stand Above The Competition With Top Level Decision Makers. Best First Impression Possible: There is a saying that you don’t get a second chance to make a first impression. This is not always true but with Top Level Decision Makers it is often true because their time is valuable and they make up their mind about you fairly quickly. Your attitude, your appearance, the energy you give off, the knowledge of your products and services, your information on his or her business and industry, must be superior and your ability to communicate must be fine-tuned when you get in front of him or her in the beginning. If you “Blow It” you may never get a second meeting. Exceed Expectations Consistently: Exceeding expectations once will not impress the Top Level Decision Makers. They know that most salespeople will do that to impress them. Consistently exceeding their expectations will separate you from the majority of other salespeople. This definitely will influences them in a positive way. Valuable Growing Asset: Make sure they view you as a valuable asset to them and their organisation. To put the “cap on it” have them see you growing more valuable to them day by day. Eventually their goal will be to retain you as a supplier because of the value you offer. (Unity Stage of the Relationship). Be Indispensable: Become such an asset that to them you are indispensable. 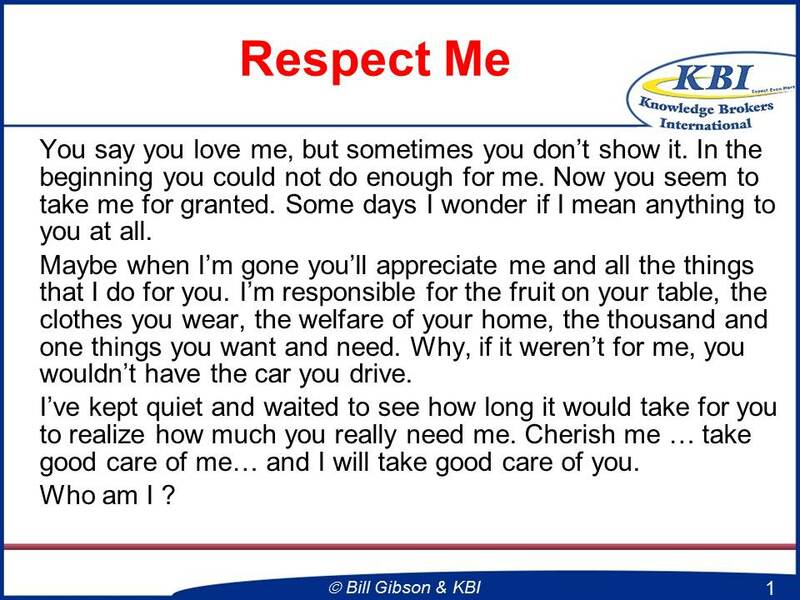 In other words they see you as irreplaceable. Often you can achieve this by being a valuable resource. In other words whenever they need any information, contacts or need a supplier or need to make a purchase they phone you and you are the one that makes their job easier by utilising your Network or Knowledge. Display Continual Self Development: Demonstrate that you are on a “never ending journey” of self-development. Share information on books, audio CD’s, DVD’s, online resources, ideas, authors, seminars and conferences that you are being exposed to that may be of interest to the Top Level Decision Makers and their team of people. If the decision maker also expresses interest in certain topics give him or her books, articles, CD’s, DVD’s that he or she may enjoy and find valuable. Top Level Decision Makers are not intimidated by people who love to learn, grow and advance. You will find that friends, associates and even family members who are not on a self-development journey will criticize you and even try and demean what you are doing. Top Level Decision Makers are the opposite. They will support and compliment you. Winning Attitude:There is a saying, “everyone loves a winner”. Top Level Decision Makers definitely appreciate someone with a winning attitude. They like being surrounded by people who are “can do” people and who look on the optimistic side of life and believe they can compete, complete, finish, conquer and win. Display a winning attitude while still displaying humbleness and respecting others and giving credit where credit is due and you will impress them. Look The Part: To have a positive attitude but be wearing shoes with the soles falling off, wearing clothes that are wrinkled and fit you like they were borrowed from, your older bigger brother or sister will not impress them. We all have to start somewhere and often don’t have the financial budget in the beginning to wear Gucci shoes and watches, although with a little effort we can find inexpensive clothes that fit, shoes that are well shined and wear clothes that are clean and well pressed. Wear the best clothes possible that are appropriate for who you are meeting with or where you are going. The same goes for your brief case, your note book, pens, brochure etc. They are part of your image and leave an impression. Keep your vehicle clean and organised as well. You may meet the Top Level Decision Maker in the parking lot. Right Language: People like to do business with people that are much like them. Become familiar with their business language and terminology and utilise it in conversation with them. Listen! Listen! Listen: Again, listen to understand not just to respond, defend, advise or sell. Ask the Top Level Decision Makers about their experience, thoughts and opinions. They would rather advise, teach and give their opinion. On the other hand they don’t like unqualified people who haven’t earned their respect try to teach or advise them. Listen and Listen and Listen when you are around them. Then speak when you really have something worthwhile to say or an intelligent question to ask. You Don’t Close, They Buy: They see themselves as the decision maker and are very tough to close. You need to provide the right amount of right information in the right way at the right time…and let them buy. If you do everything right the buy will automatically happen. Top Level Decision Makers very seldom can be closed with the Urgency Close unless everything has been properly done leading up to the close. The Urgency statement must also be truthful and make logical sense. I trust that this blog article and my previous one will help you stay above the competition with Top Level Decision Makers. Let your light shine…don’t hide it under a rock! Recently I spoke for members of BASSA (Business Analysis Summit Southern Africa) and discussed ways to influence decision makers. In sales this is a vital skill / ability. BusinessPerson Not Only A Salesperson:Understand their business, their industry, their challenges and seeing their business through their eyes. Instead of selling something, be a problem solver, a bringer of solutions tailored to their needs that are focused on the decision makers top, middle and bottom line. (Sales, Costs, Expenses and Bottom Line Profits). Exude a business man or business woman presence…not just a salesperson. 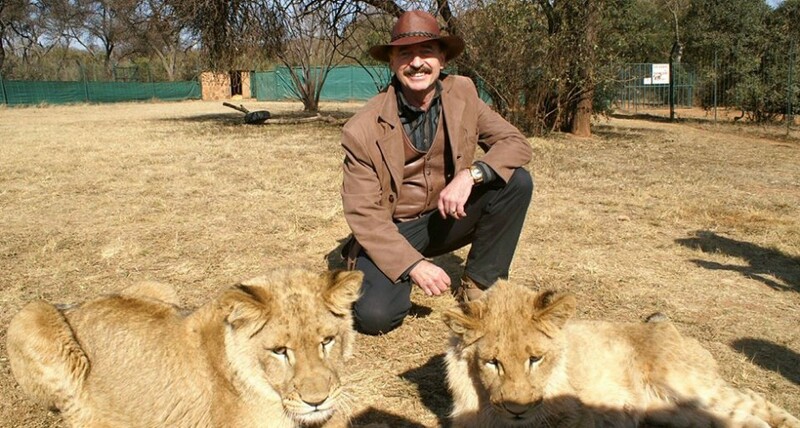 Recognizably Different than other salespeople:Especially in the Attraction Stage we know that “Uniqueness” is an important attribute. Show and prove to the Top Level Decision Makers that you are personally committed to making a real positive difference to the Decision Makers Company and to the decision makers as well. You can lack experience and credibility but if you can prove you will deliver results you will usually get hired…if you are being hired by a Top Level Decision Maker. You could have lots of experience and credibility with your educational accomplishments but can’t deliver results. With Top Level Decision Makers you will most likely not get hired. Rock Solid Confidence And Show It: Confident, well composed decision makers are not impressed with people who lack confidence and self-worth and who continually feel beneath the Top Level Decision Makers. They like confident (not arrogant), well composed people that value themselves and the products and services and company they represent. Know that confidence comes from experience. The more you do certain things and the more you affiliate with people in certain circles the more confidence and poise you build. Following are a few points that can help build your confidence. -Learn To Speak And Present: The exposure you will often get with the Top Level Decision Makers will be where you are presenting to groups and the Top Level Decision Makers are in that group as the Ruler Power Player or is part of a group of business people you are presenting to or speaking to. Enrol in a programme that teaches presentation skills, join a local “toast masters group”, buy books, utilise YouTube, CD’s, and DVD’s on the topic. Then speak in front of large and small groups as often as possible. The knowledge combined with the experience will eventually turn you into a confident effective presenter. You then will be extremely good at presenting to one, two, three people or even one hundred people. With these skills the decision maker will see and respect you as a confident individual. -Affiliate With Top People: Take every opportunity that you can to hear Top Level Executives and Leaders speak. These can be the Top Level People from your own organisation, from associations and from present and potential client organisations. By listening to these people speak, you learn the language and terminologies they use. You hear about what is relevant and current in their personal and business life at this moment. If they see you there they will view you as an associate. Then you integrate this information into your conversation and language. Also, where possible in an unobtrusive manner, ask these people intelligent questions during the question and answer period. If your remarks or questions are outstanding and show that you are an intelligent business person they will remember you…especially if you happen to personally introduce yourself afterwards. This can open the door to a follow-up phone call and meeting at a later date. -Take Notes:Whenever you have the opportunity to be with a Top Level Decision Maker we recommend that you take notes when they are giving you input, answering questions or giving their opinion or advice. It shows that you value what they are saying. Also, you will be more confident during your next encounter or during a presentation because you know and remember exactly what they said. Also, if you listen to them they will in turn listen to you. ShowA Huge Desire To Succeed: Top Level Decision Makers are impressed with ambitious, dedicated, committed people with a huge desire to succeed. That is usually how they got to where they are at and they love to see those qualities in others. They also know that you will service them well.If it happens to be that you are unhappy with the company you work for or the job you have I suggest that you either change your view of the job or get out. Go find something you enjoy because Top Level Decision Makers can sense whether or not you have that burning desire to succeed in what you are doing. What is the difference between a business owner and a staff member? The answer is quite profound…Month End! Staff members enthusiastically look forward to month end to collect their pay cheque. From the 24th of the month to the end of the month business owners are often the opposite. They are stressed out trying to get enough money in to pay the end of the month payment demands, including the staff wages. Maximising your collections efforts is vital for your continual survival and success as a business. Following are some of the simplest most effective tips I have learned from over 40 years of business ownership, collecting as a collector in my younger years in the consumer finance business and over the years designing and implementing collections programs in banks and credit departments of companies both locally and internationally. State Your Terms Upfront: The first thing I would suggest after closing the sale or contract is to take a few minutes and carefully cover what the payment terms are. Once someone commits to specific terms, they are very apprehensive about breaking the commitment or denying what they agreed to. Many salespeople and even business owners are afraid to stop at the time of closing and make the terms clear. There is a fear the client may get upset and not move forward. Utilise Credit Information: Fill out a credit application on new accounts and ones showing big changes in buying habits and be sure to check them out yourself or have your accounts check it out. Remember, there is a reason why banks do credit checks on borrowers. If you are giving credit in essence you are a bank. Service Your Customers Regularly: It is common for accounts to go into the 60 and 90 day column if the salesperson has not seen them for 60 or 90 days. Every time you or one of your people show their face, the clients think about how much they owe you. If you are there, it’s easy to mention the outstanding account. Stay in front of clients (especially slow payers) more often and you will see an improvement in cash flow and sales. Don’t Lose Their Business: If someone owes you money, they often take their cash elsewhere. The reason for this is that they are embarrassed that they owe you money and cannot pay. They still need supplies so they go elsewhere to buy. Explain to them that you do not want to lose the cash business and recommend they set up a reasonable payment plan on the old bill, and pay cash for their present orders. This way you still get the business, which you want and you are reducing the old bill. The Squeaky Wheel Gets The Grease: When someone promises to pay at 12 noon on Friday be sure you have a system of follow-up so that at 1:00pm you are calling that person if the money isn’t in. The reminder system can be electronic, done with a diary or using a pending or card file. If they don’t have the full amount, take the portion they have. Note: What often happens if you don’t follow-up immediately they pay nothing to you because they didn’t have 5000. Then they pay the 2500 to someone they owe 2500 to. Partial Payments On Promises: When someone says they will pay you 6000 on the 30th and it is now the 8th, attempt to collect a minimum of 10%-20% of that amount immediately and accept the balance at the end of the month. Note: Research shows that if you get a partial payment on the promise, the month end promise is kept more often. Be Specific: When someone promises to pay, for example on Friday then get that person to commit to a specific time, how they will pay, where they will pay and the amount agreed upon. Then get them to repeat it for clarity purposes and/or just before you hang up, re-state your understanding. Problem Solve: Be empathetic and try to assist the debtors by reviewing their situation and problem solve with them. One method the debtor could use is to contact all creditors and convince them that no one phone the debtor from the 1st to the 25th so the debtor can spend his or her time generating sales (more money to pay creditors) instead of hiding from creditors, making rash promises and feeling demotivated. This system works well if the client follows through by keeping the commitment. (Only suggest this if someone owes many creditors and is receiving collection calls daily). Sell What’s Needed: If we sell someone something they don’t need they’ll often put us at the back of the list for payment. Carefully assess the needs. The same applies to selling them more than they need or convincing them to take a longer contract than needed. Post-Dated Cheques: Ask for post dated cheques or get them to sign a debit order for their commitment. In most cases debtors will do their best to cover it. They don’t want to negatively affect their banking record. Be Flexible: Assess the type of person you are dealing with. Some clients can accept direct-to-the-point collecting and others want to feel you value the personal relationship while you are collecting. We all pay late at one time or another, so don’t get caught in ‘us’ versus ‘them’. They are still people who are often doing their best under the circumstances. Use Courier, Cab, or Student: If a client tells you he has the cheque sitting on his desk, suggest that you’ll have a cab, or courier to pick it up right away. Very quickly you’ll know whether he is being sincere. – You still keep the relationship intact. Remember: We make huge investments in advertising, marketing, selling and servicing to land and keep the client, yet in one rude or insensitive phone call from accounts you could wipe out that investment. Keep in mind we want to “Collect The Money And Keep The Client”. Use Non-Blameful “I” Messages: Be conscious of your language. A blameful “you Message” can often put the other person down and put him or her on the defense. A 3 part “I Message” is much more effective in getting the money, while not putting the other person down and still collecting the money. For the past few months your payments have been arriving late. It causes a domino affect and it has delayed me paying some of my suppliers on time. I get embarrassed paying late. Can you help me by paying on time. Don’t Threaten and Don’t Fight: A threat means you are not serious. I’d suggest that you be clear what will happen if the client doesn’t pay and then follow through, but only after using all other tactics. Don’t fight … no one wins. The client’s behavior should not control yours. Trade-Offs: If it looks like the client will be a long time paying or is close to going out of business, consider taking products or services to clean up the debt or portion of. Be sure there are no liens. I know of one case where an electrician owed a business money. The business owner got the unemployed electrician to do work for a friend and with the permission of the electrician, the friend paid the business owner instead of the electrician. All three parties were happy. Legal Action: Take legal action if you have to. Consult the small claims courts or a legal advisor to ensure you are doing it correctly. Humour: With close associates and clients that I have a great relationship with, I’ve often used humour on a 60 day account by sending the following notice that reads like this: “PLEASE COVER OR CLOSE YOUR LEFT EYE AND READ WHAT’S ON THE NEXT PAGE”. On the next page it read: “IF YOU DON’T PAY YOUR BILL THIS IS THE WAY YOU WILL READ FOR THE NEXT TWO WEEKS”. I’ve had clients call me immediately, laughing and promising to pay. You have to know your clients to do this. I trust these points were a quick tune-up on collecting the money. Let me know about any successes you have with these tips. All the best! Where our mind goes, our energy flows! 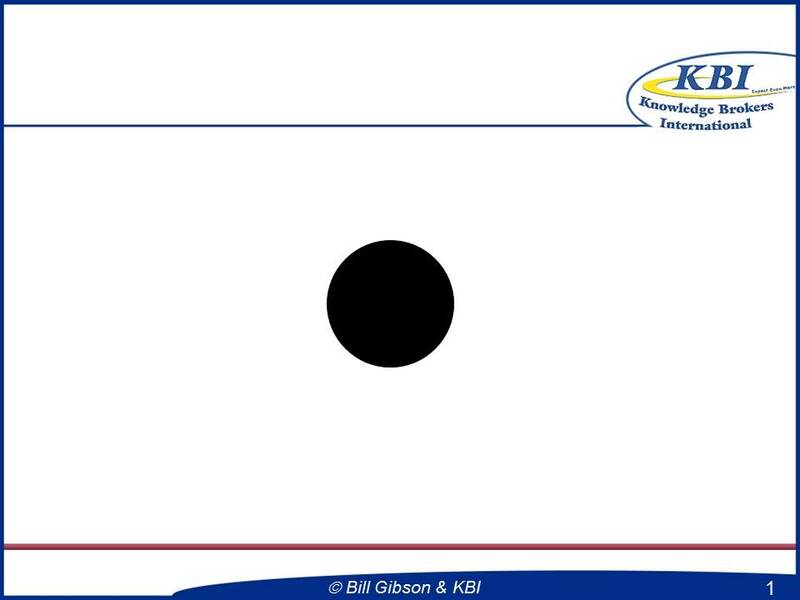 In customer service it is vital we focus on The White Space, not The Dot. Let me explain it. When we continually look at what we don’t like, what’s wrong, why things won’t work and are critical our energy gets drained and we become limited in our ability to find solutions and innovative ideas. Energy follows thoughts and feelings. What Are Some Dot Examples? The Job: When I read this quote to people at our seminars and ask people who the above quote is, they often say the customer, their wife or husband, or even their banker. In this case it is “The Job” or “Your Profession.”This is one of the finest quotes I have ever seen. It is so true for most of us. At the beginning of our new job or new company we are infatuated and excited…then we start noticing the problem areas and begin to overreact. Our jobs and companies provide many opportunities and benefits if we look for them. A good habit to start for yourself and others around you is to discipline yourselves to acknowledge 5 positives about your job or fellow workers before making a criticism.Within 60 seconds of meeting an employee of a business you and I know whether or not they are happy with their job that day. Our attitude about our job reflects either positively or negatively in our company marketing.Let’s take a look at a few more “Dot” focused situations, and see how they can be turned from “Dots” into “White Spaces” (Innovative Marketing and Servicing Ideas and Opportunities). American Express Credit Card users often pull out their American Express Card to pay for a hotel room, pay for a meal or buy a product or service and get the following answer. “I’m sorry Ma’am we don’t accept American Express but we do accept Visa or MasterCard.” The question is, what credit card did the customer prefer to use? It wasn’t Visa or MasterCard or Diners. Many businesses say they don’t carry American Express for their customers because American Express charges an extra few percentage points than other credit cards plus they seem to pay slower. Most businesses have anywhere from 50% – 150% mark-up on their products and services. Is it wise to lose the sale and the customers goodwill over 3% – 4%? The customer may want to use American Express because their Visa or MasterCard may be over the credit limit. It could be because with a rent-a-car there is automatic car insurance when they use American Express or they are well protected against “fraudulent use of the card” or it may be the only credit card they have. Getting even with American Express because you or I may be disagreeing with their policies may lose customers, goodwill and profits we can’t recover…because the client often leaves and doesn’t buy or doesn’t come back. What the person is saying, “we won’t help unless you buy.” That doesn’t make you feel positive about that business. As a matter of fact it leaves a negative impression in your mind. Which approach would earn your loyalty as a customer? Remember Innovative Attitudinal Marketing And Servicing comes from not doing what most other people and businesses do. Be different…be unique…and have a little fun. Shops that display magazines and sell books, tapes, CD’s, etc. and have signs like “Don’t Touch … Don’t Read” don’t make us feel trusted or welcome. What if the sign said? and page through or read the books or magazines. We like having you here! we know it wouldn’t be intentional. If an accident happens you can count on our understanding. As a matter of interest Neil and I convinced him to drain the next 12 cans of oil from the bottom, clean them up and display them at the gasoline pumps. If they got stolen it would only be empty cans of oil. You see, he got so focused on the Dot that he couldn’t see the positive options. How often do we do this? Most of us don’t buy a vehicle until we take it for a “test drive”. If we can’t taste it, touch it, lie on it, try it on, pick it up, smell it, listen to it, sit in it or view it, we most likely will not buy. Years ago Ten Speed Press of Berkeley, California published my Boost Your Business In Any Economy book. Around the same time I had two ½ day speaking engagements to do for Toyota U.S.A. in the Midwest of the U.S.A. The speaking engagements were 2 weeks apart. On the first Saturday, I presented my half day session and then made an offer to the group to visit me at my “table of books” and purchase my new book that was just published. About 15 – 20% of the 100 Dealer Principals and Sales Managers bought. Two weeks later I spoke to 100 more Dealer Principals and Sales Managers, but this time I put a book on each chair and told them to feel free to “page through the book” while I’m speaking. At the end approximately 80% of them bought. I allowed them to Test Drive my book. During a tour speaking at the “Big Idea” Conference sponsored by Mark Shuttleworth’s Venture Capital Company HBD Venture Capital and the S.A. Government’s Innovation Fund, I had a similar experience. Entrepreneurial Spirit Into Business Opportunities and Making Personal And Corporate Marketing And Advertising Really Pay). They asked if we were going to be here with the products on day two. We asked “why”? They replied with answers like “I don’t have cash with me”, “my credit card or cheque book is at home”, or “I need to speak to my spouse or business partner”. We responded by putting the products in a bag and said, “take them home tonight and look through them. If you decide you want them, you can pay tomorrow, if not, just bring them back”. I replied, “I can do this, the products are mine and I trust you”. 8 of the 10 people bought. At events we actually let people take the programs and electronically transfer the money at a later date. The vast majority paid immediately without follow-up. Now, some business people would say, this isn’t wise. What if 2 of those people didn’t pay and kept the product? Let’s look at it logically. The results could be R8 200 margin I would not have had. I’m not suggesting you need to do this, but it works for us. “White Space Thinking” instead of “Dot Thinking” can make a difference. This is an old saying that comes from the U.K. In South Africa it may be “Cents Wise and Rand Foolish”. How often as a consumer have you returned something to a business asking for a “refund” or “exchange” and they point at a sign that says, “No Refunds or Exchanges, sale is final!” Or, they scrutinize you, make you feel like a criminal, argue with you and finally begrudgingly give you a refund. Remember, most of us shop at large department stores and large retail chains because of their “No Hassle” exchange policies. It works. Focus on the “White Space” not the “Dot”. What am I saying? It all starts deep on the inside with the right Attitudinal Marketing. Where can you improve on your Attitudinal Marketing? Companies often promise their customers superior service and superior products through media advertising. 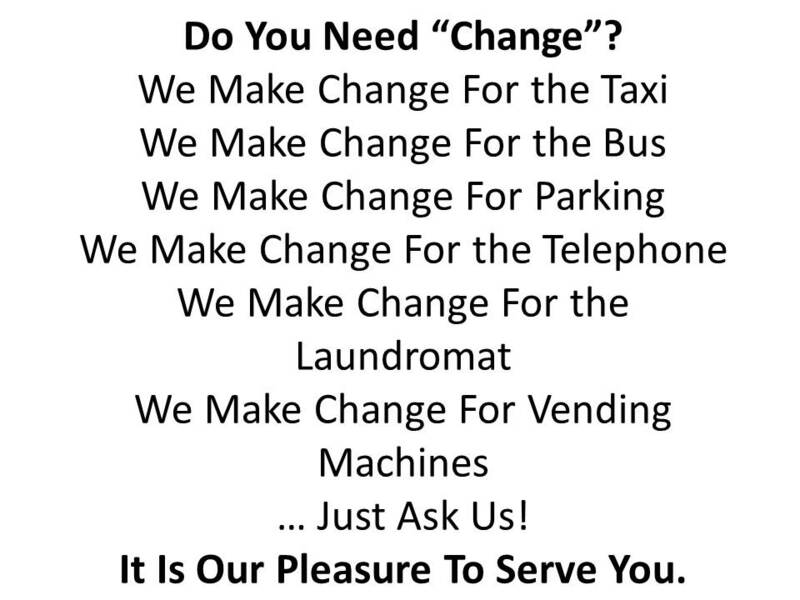 We just have to look around us to see the promises of different companies regarding service. Look at the customer service slogans below, used by companies now and in the past, to assure customers that their companies are the best option. An advertising agency or group of Marketing Executives coming up with a great Advertising Slogan does not necessarily guarantee better results. How often have we heard advertising slogans like the ones above only to experience the opposite when we phone the business, arrive at their store or office or have a problem that has to be solved? We believe Media Marketing (Advertising) has value, but we believe it has to be “backed up” from the inside-out. 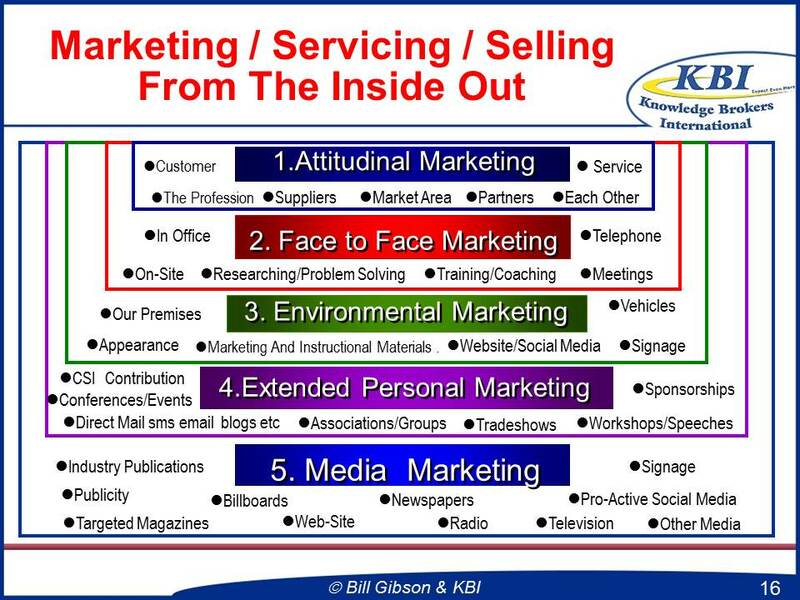 The following description of the Marketing & Selling & Servicing From The Inside-Out Model indicates the power of working from the Inside-Out. The backbone and real power of any business starts deep on the inside of a business. It starts with the attitude of management and the attitude of staff towards clients, each other, their products and services, their service approach, community and life in general. A well-used survey statistic indicated that 68% of dissatisfied customers stopped shopping at a specific retail outlet because of the attitude of the staff and management. This percentage would probably hold true in almost any business. I think most of us would agree the reason we most often don’t go back is because of the attitude of the people serving us. The next most important part of Marketing And Servicing From The Inside-Out is the face-to-face handling of the customers and each other. This is the one-to-one sales and services communication that we have on the telephone, inside our business and outside the business. This is where we either get the positive or negative “word of mouth marketing” happening. After Face-To-Face Marketing we then move to Environmental Marketing. The effectiveness of our on-site merchandising and signage inside and outside the business, combined with the direct sales aids that we use inside and outside of the business can make a huge impact on the success of the operation. This includes our web-site look and even our personal appearance. Now, if we add in the next part, extended personal contact, we’re really starting to gain ground. We can’t go and see and talk to all of our customers personally but through extended personal contact we can. Some of the tools of the Extended Personal Marketing are the use of direct mail, direct e-mail, Twitter, Facebook, Blogs, trade shows, workshops and participation in community projects. With these first four areas tuned up and working well, we are now ready to make media really work. For the last and final area of inside-out marketing we have effective use of the media. Most of the time, media is not there to actually sell the product, it is there to assist us to have initial credible contact with the customer. By maximising the first four power points we can now back up our advertising promises. 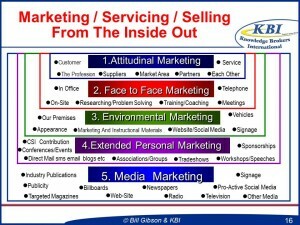 This way we develop positive “word of mouth marketing” which is the most powerful form of marketing a company can have. Staff handling, collecting money, creating a growth oriented work environment and how we emotionally feel are examples of areas not usually viewed as part of the marketing function. In my opinion, they are an important part of the marketing function because they can directly or indirectly affect the relationship with the customer. For example, a manager that speaks sharply to her front line staff often sees the staff speaking sharply to customers. The domino effect makes employee handling an important part of marketing. Healthy relationships provide effective marketing. The above commonly used research statistics indicates how impactful the right attitude is when dealing with present and potential clients. 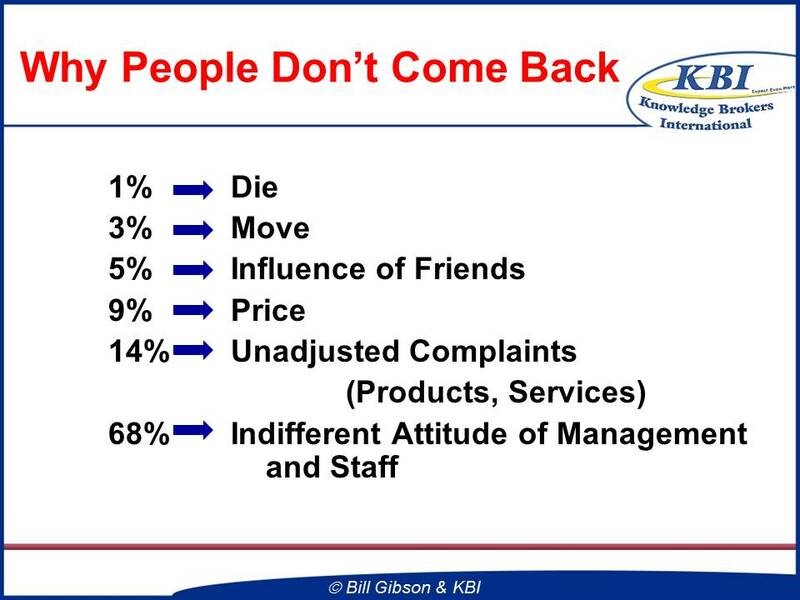 The combination of Unadjusted Complaints (which often reflects on attitude) and Indifferent Attitude of Management and Staff total 82% of the reasons why people don’t come back. These statistics support that marketing, selling and servicing is much more effective by starting with Attitudinal Marketing and Selling and Face To Face Marketing. Note that only 9% of the reason is price alone. Clients, customers and buyers often use price as the reason because it is less personal and they may not feel comfortable telling you it is your lack of skill, attitude, they don’t trust you, your product, your service or don’t like your looks. As sales or service people we are quick to accept price as the reason why they didn’t come back or didn’t buy from us. That way we do not have to closely scrutinize the part we played in losing the business. We don’t have to take accountability for the loss. Price or rates is a great way to blame an outside factor I’ve got no control over. It is wise to be honest with yourself and carefully look at the real reasons why you may lose business or not land a contract. That way you grow and improve. Our attitude is the state of our mind. We knowingly or unknowingly choose a response to any person, situation, thing or thought. Each response is generally viewed as being either positive or negative. The attitude of salespeople, management and support staff in a business has more effect on the success or failure of that operation than any other single factor. Ask yourself if “Indifferent Attitude of Management and Staff” holds true the majority of the time when you choose not to go back to a business. 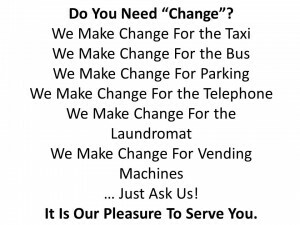 A dedication to making our customers feel welcome, happy and satisfied through their encounters with us, our people, our business and advertising is Attitudinal Marketing and Attitudinal Servicing. It is the ‘prime’ driving force of any business. In Part 2 of Exceptional Customer Care From The Inside-Out we will focus on minimising the Dot and maximising The White Space in customer service. Let me tell you a true story about a gentleman who I met a few years ago and what happened to him, because he did not just talk about “customer care” he demonstrated it and went the extra distance. The results are mind blowing. In 1973 a twenty-three-year-old man named Joe Kotow had a sales job working with a cemetery in Florida, USA. One day he received a phone inquiry from an older couple who were interested in buying a mausoleum crypt. That night Joe made his way out to the neighbourhood where they lived. At first glance it was obvious to Joe that this husband and wife were not wealthy. It was not going to be easy to persuade them to buy a mausoleum crypt. The house was a $20 000, 1200-square-foot, two bedroom home with one bathroom. The furniture was modest, and the couple was retired and living on social security. Within a month Joe got a call from the husband. He asked Joe if he could hold his cheque for thirty days while he and his wife went to Germany. They needed the money. The company agreed to wait another thirty days. Several weeks later Joe got a phone call from the wife in Germany. They were loading the car to head to the airport when her husband had a heart attack and died. She did not know what to do, but she remembered the nice young man from the cemetery. Joe’s business card was in her purse. She phoned him asking if he could help. Joe made several calls to Germany and arranged for the husband’s body to be shipped back to Florida, prepaid. He attended the small funeral and did not hear from the woman again until she phoned him one month later. She apologized for bothering him again, but she was in need of help. The trauma from her husband’s death emotionally drained her, and she had ended up in the hospital for several weeks. She explained to Joe that she was feeling okay, but that she was worried about the hospital bill, the two doctor’s bills, and some other bills. She did not even know how to write a cheque, was not sure if she had any money, and would like Joe to help her a little. Joe went to her home and, with her approval, proceeded to rummage through her deceased husband’s desk. He stumbled across a paid life insurance policy valued at $150 000. It also looked as if her husband had quite a few stocks (shares). She had some money in the bank, so Joe agreed to take a day off work and go with her. They paid the bills at the hospital and two doctor’s offices, and then he dropped her off at her attorney’s office. Joe waited patiently outside in the reception area while the elderly woman visited her attorney. After quite some time the attorney approached Joe and invited him in. He told Joe that the lady explained to him all the things Joe had done for her. She felt that she never would have made it without him, and for his time and effort she wanted to pay him. Joe informed the attorney that he was not interested in being paid. The attorney then told Joe that the woman was quite wealthy. Joe quickly explained that he had seen her house and the insurance policy, and in his own opinion she only had enough to look after herself for several years. The attorney went on to explain that they had found an additional $500 000 paid life insurance policy and $2,5 million in stock. (That was in 1973). The lady then pleaded with Joe, “Please take my gift. I have no children and no relatives anyway.” Joe finally accepted the gift of 1,250 shares of AT&T preferred stock valued at $64 000 at that time. (R500,000.00 at that time). She also gave him $100 in cash to cover the cost and expenses for him taking the day off to drive her around. In addition, she asked him to accept a handmade crystal flower basket she had bought back from Germany. Joe still has it. Every Easter morning Joe went by her condominium that overlooked the bay and picked her up and took her to the Easter Sunrise Service. She passed away a couple of years ago. I met Joe Kotow in January 1992. He had just been appointed CEO of Triple-A Employment in Clearwater, Florida. Joe told me this story in the hospitality suite after I had just spoken to his office partners at a convention on the topic of Marketing and Servicing From The Inside-Out. He did it expecting no return, and look at the lesson he learned about giving and receiving! As you can see when Joe truly helped there was really something in it for him. I cannot guarantee this will happen to you, but I can guarantee it won’t happen to someone who only thinks “What is in it for me?” Go the extra distance! Bill Gibson – Boost Your Business…Dig Deeper! Sometimes we do not dig deep enough to boost those sales and profits. One of my clients Cilla McGinley, Managing Director of Lithotech Blesston handed me the story of The Rooster And The Hen…it says it all in a simple way. Enjoy! Said the little Red Rooster, “Believe me, things are tough. Seems the worms are getting scarcer and I cannot find enough. What’s become of all those fat ones? It’s a mystery to me. But the old black hen who heard him didn’t grumble or complain. She had lived through floods of rain. She picked up a new and undug spot. The ground was hard and firm. Where fat, round worms had passed in squads back in the rainy days. When nightfall found him supper-less, he growled in accents rough. And dropped her eyes to sleep. And murmured in a drowsy tone, “Young man hear this and weep. I’m full of worms and happy for I’ve eaten like a pig. Posted in Entrepreneurship & Business Ownership, Management & Leadership, Sales & Key Account Management	| Comments Off on Bill Gibson – Boost Your Business…Dig Deeper! Everybody is always looking for the next big thing. Business opportunities are advertised everywhere with promises to make millionaires of us all within 365 days or less. Sure, if you are robbing banks – that is. It is true that there are some who have rags to riches stories about a simple, yet brilliant, idea which made them incredibly rich. It has happened, it still does and will still. But, the fact of the matter is that we do not need to sit hand in head, staring at a bowl of stale popcorn for dinner, for circumstance to force us into a moment of business brilliance. It can, and should, happen almost every day. Identify opportunities arising from your current business: Business owners need to ask themselves if their companies’ resources are being fully utilised? Is it possible to diversify or enhance the product or service currently offered? Strengths can be expanded and weaknesses corrected to provide new opportunities. An aircraft manufacturing company had a fibreglass division which was underused and costing the company money. The choice was to either close the division (costing jobs) or find an alternative use for it. The company decided to start designing bathtubs and, so successful were their designs, that a new company was formed just to design and produce the tubs. Take advantage of current situations: Some people may see it as opportunism, but fact of the matter is that we do not live sheltered lives. There are many good, and sometimes bad, events that demand attention and offer potential profits. South Africa’s high crime rate, for example, has lent itself to a huge boom in the personal security market. Armed response, pepper spray, even security complexes are now the order of the day. After a volcanic eruption on Mount St. Helens, entrepreneurs developed souvenirs and novelties for the tourism industry. It is not a matter of exploitation, but rather clever and rapid reaction to needs created by sudden changes in the environment. Magnifying (amplifying) people and events: “Magnifying or amplifying the popularity of a special person, group, enterprise or event can ensure greater demand for a product or service,” says Gibson. “Use an image-making strategy to create market demand.” This method of increasing interest is especially effective in the tourism industry. Without Nelson Mandela, Robben Island would just be another prison, would it not? Sandton Square renamed itself Mandela Square at Sandton. While it is a great tribute to the world’s greatest statesman, it is also an excellent move to magnify or amplify the status of the square. Some South Africans will argue that the large bronze statue probably does not do the man justice, but most international visitors will not see it that way. Amplify the importance of your offer, if marketed the right way, the masses will follow. Most American companies use South African or Indian-based call centres. It is cheaper for them and, especially in South Africa’s case, the quality versus cost ratio is especially favourable. Many local companies have caught on to this and are making vast sums of money. Taking advantage of a fashion opportunity also falls into this category. Skateboarding, for example, has become very fashionable again. The same can be said for the clothes, music, and equipment that go hand-in-hand with the skateboarding culture. It needs to be taken advantage of. Find use for waste materials: South African billionaire, Patrice Motsepe, started his empire by coming to an agreement with a gold mining company to utilise the dust left from its mining activities. With a special process for extracting gold from the dust he built his business. Today, Motsepe is involved in all manner of industries including mining, finance and soccer. One company’s waste can be another’s bread and butter if utilised the right way. “A market switch happens when consumers move from one type of product to another on a long-term basis,” says Gibson. “Just think of society moving from VHS to DVD players, from tapes to CDs to MP3s and such.” When a market switch occurs a whole host of other industries benefit from it. Packaging is needed for the new ranges of products. Other support equipment is needed to enhance products’ fashionability for the consumer. Cell phones are a classic example of secondary offers enhancing the image of a base product. There are many other areas which we can explore to find that business idea that will make our dreams a reality. Newspapers are full of potential ideas, if we only open our minds to the possibilities hiding amongst the pages. Gibson says that we have trained ourselves to miss the obvious, to look in the wrong places and to over complicate the matter. Business genius is not born from a bowl of stale dinner popcorn, it is all around us. In everything we do, in everything we read, in every travesty and adversity we may face. We just have to be positive enough to see beyond a few strands of hay.